Crème brûlée (pronounced "krem broo-LAY") is a classic French dessert consisting of a custard topped with caramelized sugar. 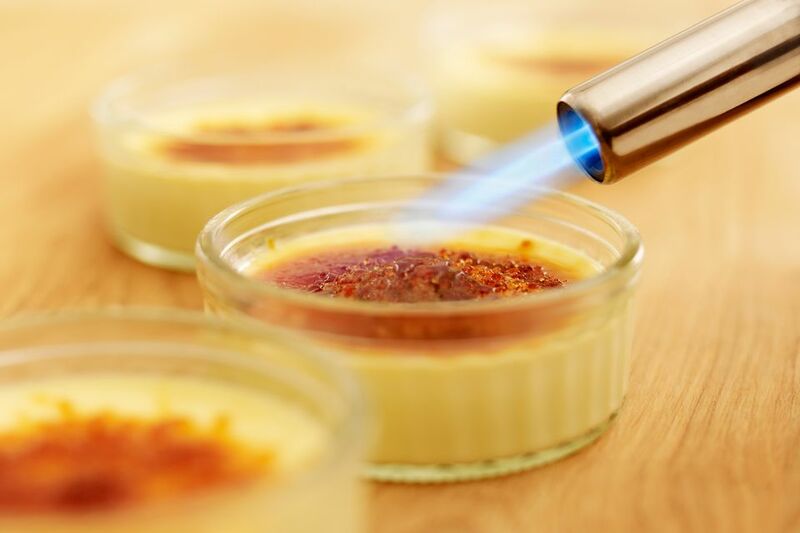 There is much about crème brûlée to fascinate anyone with interest in food science, and how things work in general. The custard itself is a deep topic, a textbook example of the thickening powers of egg yolks and the way proteins change their structure when heated. The burnt sugar topping is likewise a demonstration of the fundamental culinary phenomenon of caramelization, which is the way carbohydrates turn brown (think toast in a toaster) when exposed to heat. Plus, if you've ever heard a baker or pastry chef musing about how sugar is a liquid, you may or may not have understood what they meant. For instance, if you've followed a cake recipe that involves mixing the wet ingredients separately from the dry ones, then combining them to form the batter, you know that sugar goes in with the wet ingredients. Well, when you caramelize a crème brûlée, you get to see for yourself that sugar really is a liquid. Honestly, that alone is reason enough to make crème brûlée. But there's an even better reason. Crème brûlée happens to be, quite possibly, the perfect dessert. Its simplicity (custard with sugar on top!) belies a heavenly balance of sweet, creamy, lightness, and crunch that might easily move Romantic poets to rhapsodize about Golden Means and suchlike. And there is something elegant about the ratios involved: 8 egg yolks, two cups of cream — a third of a cup of sugar. Speaking of caramelizing, let me tell you something else about creme brulée: it is a guaranteed crowd-pleaser. I've made it hundreds of times for clients' dinner parties, and when the chef takes out a blowtorch, everyone, even the most jaded pop star or politician, stops what they're doing and watches. The procedure involves combining cream, egg yolks, and sugar, then pour the custard into small dishes like these ramekins and then baking them in a water bath until set. The water bath produces a gentle, steamy heat in the oven, which helps keep the custards from cracking. After chilling, sprinkle granulated sugar on top and caramelize with a torch until golden brown. The sugar will melt and then harden into a glassy layer on top of the custard. I generally serve them topped with fresh mixed berries and a dusting of powdered sugar. I will almost always flavor my creme brulée with vanilla extract (a teaspoon added to the custard before baking), but to get extra fancy you can heat the cream and simmer a couple of vanilla beans in it. Then slice the beans open, and scrape the vanilla goodness within into the cream. Make sure to let the cream cool before combining with the egg yolks. Otherwise, you'll scramble the eggs. What Are the Main Varieties of Spanish Sherry Wines? What Makes Azorean Cuisine Distinct? Do You Know the Difference Between Jam, Jelly and Marmalade? It's Easy. How Does a Brisket Become Corned Beef?